2006's Wii Play was once the best-selling game in the US ever, so the only surprise is that it's taken Nintendo so long to announce a sequel. 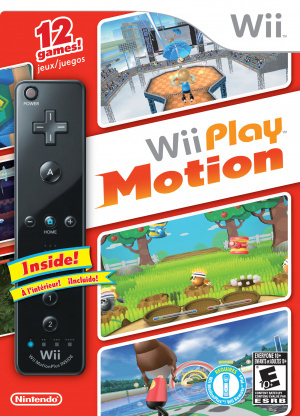 Wii Play: Motion is Nintendo's new pack-in title for the Wii Remote Plus, heading to North America on 13th June. 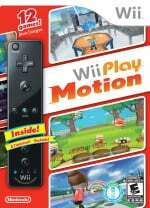 Containing 12 minigames that all require the MotionPlus — or bundled black Wii Remote Plus — Wii Play: Motion will be hoping to ape its predecessor's sales success. Judging from the box art and press release, players will be engaging in a little mole-whacking, flying disc-throwing and umbrella-wielding. 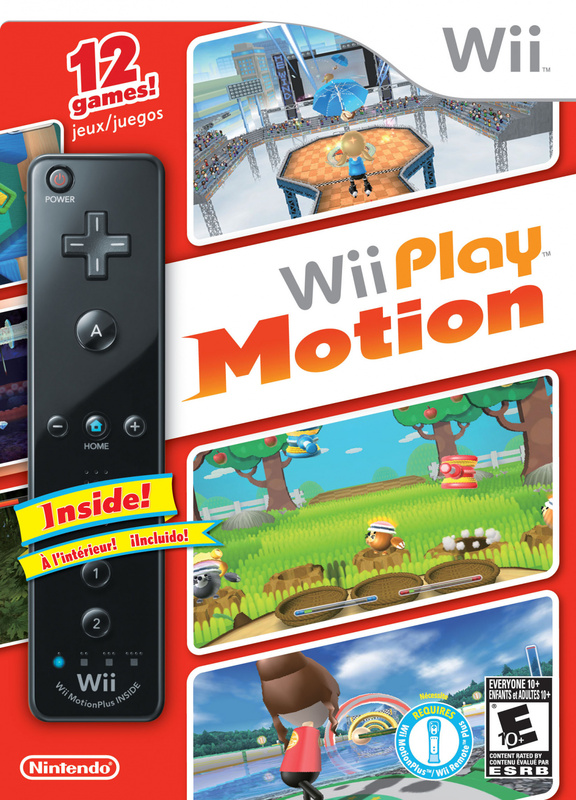 We'll have more on Wii Play: Motion as 13th June approaches. Wii owners will be twisting, turning and enjoying themselves like never before, whether they’re newcomers to the console or have already discovered the fun of the popular Wii Play game. From catching a gust of wind by tilting an umbrella to fending off garden pests by swinging a mallet, each of the 12 included games will have players smiling wide as they use their Wii Remote Plus controller (or Wii Remote with Wii MotionPlus™ accessory) in a variety of interesting, sometimes unexpected ways. Wii Play: Motion comes packaged with a Wii Remote Plus controller – which combines the original Wii Remote controller with the precision of Wii MotionPlus – to deliver great value, precise motion control and immersive social fun that anyone in the household can pick up and instantly enjoy. 12 minigames ? Are you kidding me ? I really hope those games are long enough to not bore after 15 minutes like the first one did. And if I want a Wiimote Plus, I'll wait for Zelda SS pack, thank you very much. Hopefully this set will be better that the last ones. Wii Play was a waste of $10. ^Agreed. But I payed $50. Sorry James, but I'm pretty sure, as of last month, Call of Duty Black Ops is the best selling game ever in the US. Overall I don't see the point of this after Wii Party. I hear that Wii Party was somewhat decent though, so I hope this has a solid suite of games as well. So far the only Wii series title I truly enjoyed was WSR. I don't think I need another remote. that was the main reason why I bought the first one. Yeah Black Ops is definetly the highest selling video game in the US ever. I don't think Wii Play is even the second, as Modern Warfare 2 I believe is higher. Hah! I KNEW they would anounce a Wii Play Motion Plus sequal anytime now considering E3's just a couple of months away. Anyways, I'm looking forward to this! People still using that "dust off your..." gag? I would rather have another Wii Sports but this might work. Ugh, why taint the comments with discussions of Modern Warfare? I'd have left gaming ages ago if that series were representative of the medium. : - / It's like listening to the staggering box office sales of a movie like Transformers; depressing, makes me want to follow Farnsworth to another planet. Back on topic, Wii Play was great fun for its simplicity, and Motion Plus should have had something like this ages ago as a requisite second purchase after Sports Resort. Flingsmash is fun but not varied enough to really show off what Motion Plus can do. I hope that's not true about Wii Play being the most sold game in the US. It was a waste of time and money. Only good thing was getting a free wiimote. @Billy-Beauts Curses, why can't sales figures just stay the same so I don't have to do my fact-checking before I post something? Come on guys, just stop buying games, OK? Why are all the bundled ones Black! I want a white Wiimote! If the price is right, I'll get it. Need more Motes for GE. Wii Play was awesome and highly addicting when it cam out and I can't wait for this one. WiiMotionPlus will add all sorts to it. It'll be a different beast to Wii Party I'm sure and will be like an expansion on wii sports resort (sort of). Bring it on. Insta-insta-buy all the way. (The mini-games won't be like wii party but have more of the depth of wii sports resort kind of, you can't compare the two too much). Wariowoods is spot on the money too btw! Now all Nintendo has to do is announce that Vitality Sensor game hopefully before E3 (Miyamoto said E3 wasn't the right enviornment to announce their game that uses it and I couldn't agree more). Huh. Hard to argue with the numbers on the first one, but as a penguin might say on the eve of Armageddon... The climate has changed. Not sure if this will be enough to re-energize the Wii market in the wake of Move/Kinect. But if the games are good, I'd think about picking this up (game only — I have enough M+). Looks interesting. Hopefully there's a good mix of games. And chuck in Tanks again for the sake of it. Is it a game with a Wii Remote + ? Is it a Wii Remote + with a game ? I believe it'll be the last one. Hm, hopefully this does well. As of March 10th (I didn't look for a newer list) NPD has Wii Play listed as the 2nd best selling game in the U.S., right below Black Ops. That said, Black Ops was released on FIVE different platforms, and the sales numbers combine all sales on all platforms. I can't help but question the validity of such a listing, since Wii Play was only released on the Wii. Does anyone know if Black Ops outsold Wii Play from sales on just one console? I'm not trying to start an argument, and I'm certainly not defending Wii Play, but it does seem a little unfair to put 5 versions of a game together on the charts. The first one was a cool tech demo back when the wii first came out, but they better add some more content this go around. I only got Wii Play because everywhere was sold out of wii remotes when we got our wii. The game was only $10 when you figure in the price of the wii remote. It probably could be worth $10. I enjoyed Wii Play, especially the pool. Cue Sports from Hudson quickly replaced it as my primary pool game, though. I'll probably pick up the standalone game for a few bucks since I already have two MotionPlus attachments. If I need a third, I'll just buy an old MotionPlus since they are pretty cheap nowadays. I'm a cheapskate, I know. Europe gets a Red Wiimote +. SOLD. Oh yea, the original was on my waiting to buy list that never happened. Might just grab it now for the little ones now that its pretty much a free game now. Eek! Another game my wife is going to want because she thought it was fun at the house THAT she Nanny's for and then will wind up only playing it for a week. I'll wait for the combo with wii party, Wii sports Resort and Wii play motion. Holding my breath in 3, 2, 1. I'll have to sell this remote, get a few bucks. Ugh, the boxart looks terrible even. the first wii party was awesome! we'd still be playing if it hadn't stopped working all of a sudden, this should be a awesome replacement! Well, I expected this to happen earlier. Its way too late now "introducing" the MotionPlus. It should have been done along with the WSR or close to it. I hope it's better than the original. I hope it supports 4 players unlike the original, which supported only 2. Meh, I'd rather buy just a Wii Remote Plus. I will probably get this just so I feel like slightly less of a chump for buying 4 Motion Pluses that never get used. Is anyone really fool enough to buy more accessories from Nintendo before they start producing games that support them? Motion+ has been around for two years and still nobody wants to make games that use it--that's ridiculous. Like the last time, getting it only for the Wii-mote (Plus). They should just release Tanks! Reloaded for WiiWare. Actually, I loved Wii Play, honestly. Fifty bucks says everyone who buys it will buy it for the packaged controller again. I'd really need to see the games line-up, but the red remote plus for the Euro version is definitely tempting. Tanks in the first game was okay, but now I have a pretty good tank game in Tron on the Wii. I do think billiards would benefit massively from WM+ so here's hoping there's an enhanced version (or the guys that do that official tournament snooker game put out a Wii Motion Plus version) of that as well. This would be much more interesting to me if it had a white WM+. White is the iconic Wii color...why are they abandoning it? I'll probably only pick it if it's cheap unbundled. You mean nintendo's actually supporting one of their peripherals with new games? Madness!!! Already have a black remote plus sorry Nintendo. Can you buy it without the remote? I don't really want a fifth one. I thought the original Wii play was pretty good. It didn't hold my attention very long, but for ten bucks it was well worth it. If this is like Wii Sports resort, then count me in. What 'Dust off your' gag? Are you refering to somebody using the line "Looks like it will finally be time to dust off my Wii Motion Plus" lol I seriously hate it when people say their system is collecting dust. it's so overused, and is just a negative jab at the system or the device to annoy other people who enjoy it. But yup, the Wii MotionPlus IS totaly underused. While I'm not that excited (although a red remote in the PAL package is tempting) it hopefully points to some more WM+ support coming (apart from the obvious Zelda). I'd like to see some more big titles using it, and with Nintendo's push here to get more WM+ units into homes that might be more attractive for developers. More of these types of games...come on NOA, where is Xenoblade, Pandora's Tower, The Last Story?? This is perfect, I want a new motion+, my mom probably would enjoy the game, well hopefully there will be something there for her. A red Wii-mote!, are red nunchucks announced yet? I would like to see a much larger billiards game in Wii Play Motion, i enjoyed the billiard mini game from the first one, but if they add it, and improve it in many ways, that would be cool. @motang Xenoblade is confirmed and coming propably soon, Pandora's Tower isn't even ready yet and The Last Story i don't know. If they focus on simple multiplayer games with staying power, I'm game. Several of the games from the first Wii Play still pop up when friends get together for pizza and a beer.